Rakhshani, N., Araste, M., Imanzade, F., Panahi, M., Safarnezhad Tameshkel, F., Sohrabi, M., Karbalaie Niya, M., Zamani, F. (2016). Hirschsprung Disease Diagnosis: Calretinin Marker Role in Determining the Presence or Absence of Ganglion Cells. Iranian Journal of Pathology, 11(4), 409-415. Nasser Rakhshani; Mohammadreza Araste; Farid Imanzade; Mahshid Panahi; Fahimeh Safarnezhad Tameshkel; Masoud Reza Sohrabi; Mohammad Hadi Karbalaie Niya; Farhad Zamani. "Hirschsprung Disease Diagnosis: Calretinin Marker Role in Determining the Presence or Absence of Ganglion Cells". 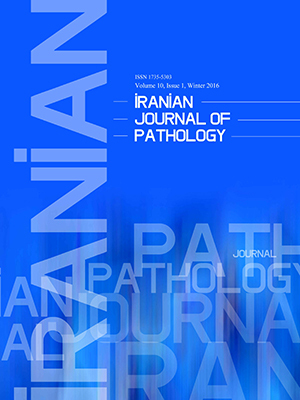 Iranian Journal of Pathology, 11, 4, 2016, 409-415. Rakhshani, N., Araste, M., Imanzade, F., Panahi, M., Safarnezhad Tameshkel, F., Sohrabi, M., Karbalaie Niya, M., Zamani, F. (2016). 'Hirschsprung Disease Diagnosis: Calretinin Marker Role in Determining the Presence or Absence of Ganglion Cells', Iranian Journal of Pathology, 11(4), pp. 409-415. Rakhshani, N., Araste, M., Imanzade, F., Panahi, M., Safarnezhad Tameshkel, F., Sohrabi, M., Karbalaie Niya, M., Zamani, F. Hirschsprung Disease Diagnosis: Calretinin Marker Role in Determining the Presence or Absence of Ganglion Cells. Iranian Journal of Pathology, 2016; 11(4): 409-415. Background: Hirschsprung disease is a complex genetic disorder of the enteric nervous system (ENS), often called congenital aganglionic megacolon and characterized by the absence of enteric neurons along a variable length of the intestine. The definitive diagnosis of Hirschsprung disease relies on histologic and/or histochemical staining of sections from suction rectal biopsies. Calretinin immunohistochemistry (IHC) may be a useful in its diagnosis. This study aimed to proof the usefulness of immunohistochemical staining for calretinin in rule out of Hirschsprung disease. Methods: Paraffin blocks and slides were retrieved from the pathology archives of Ali Asghar Hospital, Tehran, Iran from 2007 to 2011 with pathology report based on the presence (14 patients) or absence (70 patients) of ganglion cells and transitional zone anatomical region (10 patients). Slides were stained with hematoxylin and eosin method to confirm the initial diagnosis was verification again. After preparing the slides, they were stained by IHC for calretinin. Then, the results were analyzed using SPSS software. Results: In most patients, IHC for calretinin provided highly compatible results with hematoxylin-eosin findings in diagnosis of Hirschsprung disease. The values of specificity and accuracy between calretinin and standard histology (H&E) compared by the Fisher exact test declared calretinin presented significantly higher specificity and accuracy values than H&E staining (P <0.0001). Conclusion: Calretinin IHC overcomes most of the difficulties encountered using the histology hematoxylin-eosin. Then, IHC for calretinin is a good ancillary method used by pathologists in diagnosis of Hirschsprung disease. McKeown SJ, Stamp L, Hao MM, Young HM. Hirschsprung disease: a developmental disorder of the enteric nervous system. Wiley Interdisciplinary Reviews: Dev Biol 2013;2(1):113-29. Kacar A, Arikök AT, Azili MN, Ekberli AG, Tiryaki T. Calretinin immunohistochemistry in Hirschsprung's disease: An adjunct to formalin-based diagnosis. Turk J Gastroenterol 2012;23(3):226-33. Kapur RP, Reed RC, Finn LS, Patterson K, Johanson J, Rutledge JC. Calretinin immunohistochemistry versus acetylcholinesterase histochemistry in the evaluation of suction rectal biopsies for Hirschsprung disease. Pediatr Dev Pathol 2008;12(1):6-15. Borrego S, Ruiz-Ferrer M, Fernández RM, Antinolo G. Hirschsprung’s disease as a model of complex genetic etiology. Histol Histopathol 2013;28(9):1117-36. Hiradfar M, Sharifi N, Khajedaluee M, Zabolinejad N, Taraz Jamshidi S. Calretinin immunohistochemistery: an aid in the diagnosis of Hirschsprung’s disease. Iran J Basic Med Sci 2012;15(5):1053-9. Saha AK, Ali MB, Biswas SK, Sharif HZ, Azim A. Neonatal intestinal obstruction: patterns, problems and outcome. Bangladesh Med J Khulna 2013;45(1-2):6-10. Karim S, Hession C, Marconi S, Gang DL, Otis CN. The identification of ganglion cells in Hirschsprung disease by the immunohistochemical detection of ret oncoprotein. Am J Clin Pathol 2006;126(1):49-54. Gui H, Tang W-K, So M-T, Proitsi P, Sham PC, Tam PK, et al. RET and NRG1 interplay in Hirschsprung disease. Hum Genet 2013;132(5):591-600. Bachmann L, Besendörfer M, Carbon R, Lux P, Agaimy A, Hartmann A, et al. Immunohistochemical panel for the diagnosis of Hirschsprung's disease using antibodies to MAP2, calretinin, GLUT1 and S100. Histopathology 2015;66(6):824-35. Staines W, Bettolli M, De Carli C, Swinton E, Sweeney B, Krantis A, et al. Fast evaluation of intraoperative biopsies for ganglia in Hirschsprung's disease. J Pediatr Surg 2007;42(12):2067-70. Dobbins III WO, Bill Jr AH. Diagnosis of Hirschsprung's disease excluded by rectal suction biopsy. N Engl J Med 1965;272(19):990-3. Huang C-C, Shih S-L, Chen Y-F, Yang F-S. Hirschsprung Disease and Contrast Enema: Diagnostic Value of Simplified Contrast Enema and Twenty-Four-Hour-Delayed Abdominal Radiographs. J Radiol Sci 2011;36(3):16-21. Gonzalo DH, Plesec T. Hirschsprung disease and use of calretinin in inadequate rectal suction biopsies. Arch Pathol Lab Med 2013;137(8):1099-102. Guinard-Samuel V, Bonnard A, De Lagausie P, Philippe-Chomette P, Alberti C, El Ghoneimi A, et al. Calretinin immunohistochemistry: a simple and efficient tool to diagnose Hirschsprung disease. Mod Pathol 2009;22(10):1379-84. Kapur RP. Can we stop looking? Am J Clin Pathol 2006;126(1):9-12. Holland SK, Ramalingam P, Podolsky RH, Reid-Nicholson MD, Lee JR. Calretinin immunostaining as an adjunct in the diagnosis of Hirschsprung disease. Ann Diagn Pathol 2011;15(5):323-8. Yadav L, Kini U, Das K, Mohanty S, Puttegowda D. Calretinin immunohistochemistry versus improvised rapid Acetylcholinesterase histochemistry in the evaluation of colorectal biopsies for Hirschsprung disease. Indian J Pathol Microbiol 2014;57(3):369. Barshack I, Fridman E, Goldberg I, Chowers Y, Kopolovic J. The loss of calretinin expression indicates aganglionosis in Hirschsprung’s disease. J Clin Pathol 2004;57(7):712-6. De la Torre L, Santos K. Hirschsprung disease. Evaluation of calretinin and S-100 as ancillary methods for the diagnosis of aganglionosis in rectal biopsies. Acta Pediátr México 2012;33(5). Bodian M, Stephens FD, Ward BC. Hirschsprung's disease and idiopathic megacolon. Lancet 1949 1;1(6540):6-11. Qualman SJ, Murray R. Aganglionosis and related disorders. Hum Pathol 1994;25(11):1141-9. Iwashita T, Kruger GM, Pardal R, Kiel MJ, Morrison SJ. Hirschsprung disease is linked to defects in neural crest stem cell function. Science 2003;301(5635):972-6. Monajemzadeh M, Kalantari M, Yaghmai B, Shekarchi R, Mahjoub F, Mehdizadeh M. Hirschsprung's disease: a clinical and pathologic study in iranian constipated children. Iran J Pediatr 2011;21(3):362-6. Lim KH, Wan WK, Lim TKH, Loh AHL, Nah SA, Chang KTE. Primary Diagnosis of Hirschsprung Disease–Calretinin Immunohistochemistry in Rectal Suction Biopsies, with Emphasis on Diagnostic Pitfalls. World J Pathol 2014;3(3).